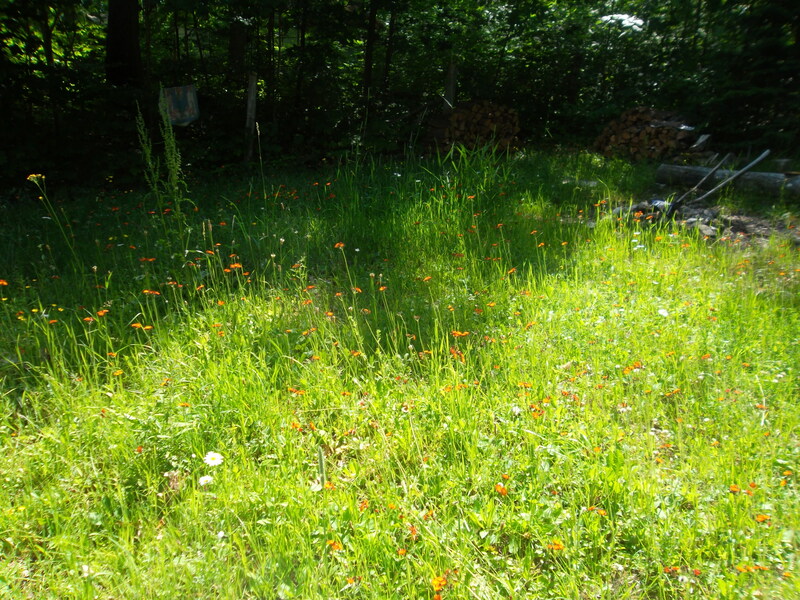 We arrived at the cottage a month after our last visit to find the front and back yards overgrown – grass, some of it up to our waists. An abundance of rain in our absence had produced a wild crop. In this wild crop, I counted eight varieties of wildflowers/weeds. We don’t try to keep a perfect lawn here; we just keep it short. God has lavished the earth with plant life. Seeds sown at creation still produce. It makes me wonder what the first daisies looked like. Were they taller, larger, with more vibrant yellow centers? In my handful of pickings I found: devil’s paintbrush (pilosella aurantiaca) – that sadly named bright orangey-red weed. Daisies, of course – appreciated for their ability to tell if he loves me or not. One of my favourites – Queen Anne’s lace, also known as wild carrot, which apparently is edible. (I won’t be eating it.) It stands attractively dainty and tall. Three varieties of yellow weeds – one, I think, is winter cress. Forget-me-nots, low-growing with purplish-blue blooms also decorate the yard. All of these grow in a small plot of land, without care, depending entirely on the grace of God to send rain and sunshine. If that is how God clothes the grass of the field, which is here today and gone tomorrow, will he not clothe you, O you of little faith? So don’t worry, saying ‘What shall we eat?’ or ‘What shall we drink?’ or ‘What shall we wear?’ For pagans run after these things, and your heavenly Father knows that you need them. Trust in the Lord. Lean on Him. Don’t worry about the future. Though the world may seem out of control, our heavenly Father has all things under His control. Rose McCormick Brandon is the author of four books – see Writing From the Heart. Gallery | This entry was posted in devos and tagged faith, fear, God's kingdom, Jesus, message from God, Prayer, trust, weeds, wildflowers, worry. Bookmark the permalink. Diana – love hearing from a wild flower lover . . .
Nice post, Rose. I love wildflowers…what we often call weeds. Jesus said Solomon in all his glory was not clothed as beautifully as these wildflowers. I remind myself of that when I worry about my appearance, my weight, my clothes…all those things we women worry about. Thank you for the reminder. BTW, i tried wild carrot many years ago. You have to dig them in their first year, before they bloom (they are biennials, blooming the second year) and we used the little white carrots in stews and soups. They taste like a cross between a carrot and a parsnip. Nice in stews, etc. But one has to be very aware of what exactly wild carrot looks like because there are a couple of closely related plants that look very similar that are very poisonous.